The Queen Mary 2, shown here leaving the Yard for builder's trials, was built in Alstom’s Chantiers de l’Atlantic yard, St Nazaire, for Cunard (launched in 2003). She is the first passenger liner in which metal fatigue was considered in the initial design. 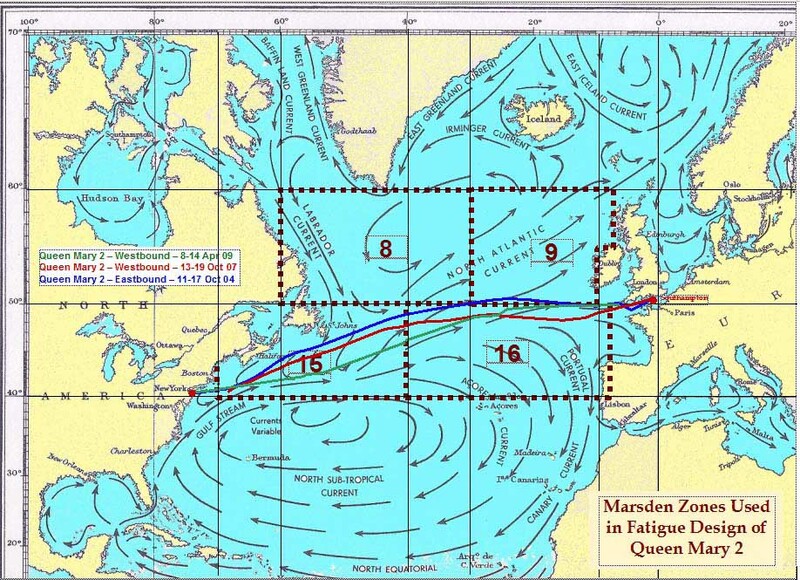 Designed for 40 years of North Atlantic environment defined by Marsden Zones 8, 9, 15 and 16. At 60% utilization, i.e., 24 years, she will encounter an estimated 90,000,000 waves or 3,750,000 waves per year. Longitudinal end connections in way of the waterline are prone to high rates of cumulative fatigue damage from effects of wave passage. End connections at the extreme fibers of the hull, i.e., highest deck and bottom shell, accumulate fatigue damage mainly through global bending response. Thus, fatigue analysis for 40-year life resulted in increased scantlings, modified side shell longitudinal connections, additional stiffening, higher grades of steel and revised grinding of plate edges and welding techniques.. Only 2 of 4 yards approached understood Cunard's requirements. Several upper passenger decks were fabricated from Lloyd’s AH36 whilst parts of side shell plating were DH36. Also, steel with high notch toughness was used in the bottom shell plating. Aluminum in the superstructure was avoided in the Queen Mary 2 because of continuous cracking experienced in the top five (aluminum) decks of the Queen Elizabeth 2.